When a presidential candidate dies unexpectedly in the middle of the campaign, Washington, D.C. alderman Mays Gilliam is unexpectedly picked as his replacement. 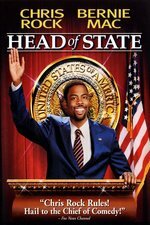 This movie is based on the unbelievably zany idea that an African-American man could be a serious presidential candidate. What will happen when Mays Gilliam, representing the fictional 9th ward of Washington, D.C., runs in a presidential election against a war hero who has served as vice president for eight years and is Sharon Stone's cousin? Did he kill Jon-Benet Ramsey? Is he really pro-cancer? And will he get the girl??? Head of State includes appearances by Tracy Morgan, Nate Dogg, white men in bow ties, Osama bin Laden, and professional prostitutes, as well as the late Bernie Mac and James Rebhorn. God bless America, and no place else. Security! In another world there is an analog to Dennis Leary making a joke not about Jon Bon Jovi and Stevie Ray Vaughn but instead about Eddie Murphy and Bernie Mac. I miss that man.